Learn about the two important functions of clean grease filters in the commercial kitchen. In the world of commercial kitchen exhaust system cleaning, a lot of attention is given to keeping exhaust hoods and ductwork clean. But grease filters are actually another very important piece of the puzzle. Fire Prevention: The first function of a clean grease filter is to help reduce fire hazards in the commercial kitchen. As grease-laden air passes through the filter, the grease particles are captured. The end result is less grease getting into the ducts, where it could pose a serious fire hazard. 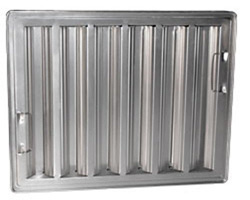 Some types of grease filters also include a spark arrestor feature, which provides even more fire protection by preventing sparks generated by cooking with solid fuels like wood or charcoal from entering the ductwork. Proper Airflow: The second function of a clean grease filter is to help promote proper airflow in your kitchen. Without a grease filter, the extra grease that would accumulate on the walls of your ductwork could actually increase drag inside the ducts. 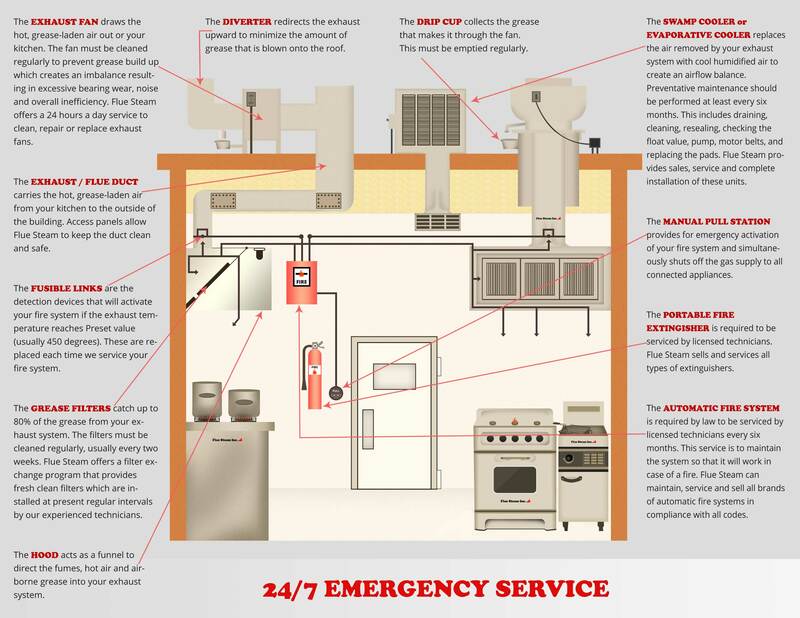 This would cause your exhaust fan to work overtime, potentially increasing wear and tear on the system. The reduced airflow would also lead to issues with smoke and odors in the kitchen. Unfortunately, the dirtier a grease filter gets the worse it performs. A dirty grease filter can be a fire hazard in and of itself, and it can also restrict airflow even more severely than dirty ducts would. Grease filters for commercial kitchens may get dirty quickly, but the good news is they are designed to be cleaned and reused. As a first step, you should have your staff inspect the grease filters at the end of each day. If the filters appear greasy, they should be removed and cleaned. Most types of grease filters can be cleaned easily by applying a degreaser, letting them sit a while, and then running them through your commercial dishwasher. But what if your staff doesn’t have time for these tasks? Or what if your kitchen runs 24 hours and you can never leave your appliances without grease filters for any amount of time? You can use Flue Steam’s grease filter exchange service to guarantee yourself clean filters. We will come out every week or so to remove your old, dirty filters and replace them with clean ones. This doesn’t mean you have to purchase new filters every time—instead we will clean your old filters for you and bring them back on the next visit. So you really only need two sets of filters to take advantage of this service. To learn more about getting grease filter exchange service on a schedule that works for your business, please call 800-700-FLUE now.